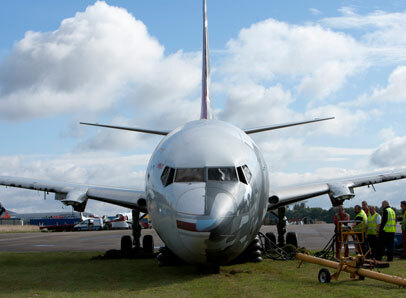 AMS offer internationally recognised training on the use of aircraft recovery equipment (endorsed by IATA Members). “Many companies provide aircraft recovery equipment in addition to other business, but AMS are the only company that specialises in this field. Their vast experience is evident when using their equipment, during the well run practical training courses held in the UK. “Sharjah International Airport has used AMS on many occasions over the past five years. They are specialists in their field and offer advice, with a follow-up of excellent after sales service which is invaluable. In addition to their recovery equipment, we have used their training facilities to send fire fighters on courses to AMS’s training location in the UK, as well as employing AMS to run courses at Sharjah International Airport. The industry leading training we provide sets us apart from our competitors: airlines, airport authorities and military air forces from around the globe invite us to train their teams (or send their personnel to our training facility in the UK). Over recent years we’ve seen interest in our training courses extend to cover other industries closely linked to aviation recovery, including aircraft engineers, fire crews and aircraft insurance assessors. The ability to understand how aircraft should be recovered safely, while preserving the integrity and structure of the aircraft (to reduce damage and associated costs), plays a significant role in the way aircraft recovery training is developing. We’re delighted to be at the forefront of this aspect of our work with the aviation industry and associated bodies. Since 1988 AMS have trained over 1,100 participants across the world. 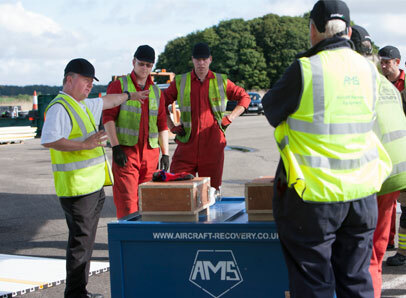 AMS developed a bespoke Aircraft Recovery Awareness training course with the experts at McLarens Aviation* (formally Airclaims) to experience the handling of physical aircraft recovery events. This particular course is held at AMS’s dedicated training facility in the UK, using AMS manufactured equipment and current aircraft types. * McLarens Aviation is the leading provider of claims, risk and asset management services to the aviation and insurance industry. “It is not often we get to experience the aviation industry in such an environment and the opportunity to rub shoulders with the people who live and breathe it. Getting our hands dirty is a real privilege and certainly one I will have no hesitation in thoroughly recommending.